Why Do My Points Keep Burning Out? If your points keep burning out after fitting a new good quality condenser, I would check that you have the correct ignition coil fitted, there are two basic types, ballasted (10v) and non-ballasted (12v). Alpines for the UK will normally be fitted with a non-ballasted (12v). With the leads disconnected a non-ballasted coil will read about 3ohms across the terminals. Alpines for export may have a ballasted coil (10v) fitted this will read about 1.5ohms across the terminals and must be used with a ballast resister of about 1.5ohms; this reduces the current following though the points. Many UK cars have ballasted coils (10v) fitted so it is possible to have the wrong one fitted. The main purpose of a ballasted coil (10volts) is to improve starting, when the starter motor turns, it pulls the battery voltage down to 10volts, so a non-ballasted coil (12volts) is now 2 volts short (weaker spark), in a ballasted system we now bypass the ballast resister giving the coil full battery voltage 10volts, no reduction in voltage. This is normally done by a switch inside the starter solenoid. 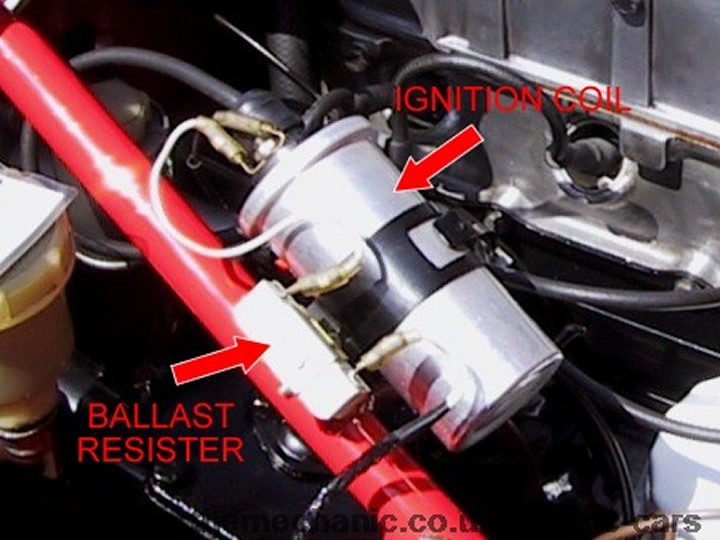 If you have car with a ballasted coil and it won't start when cold check the resister bypass switch in the starter solenoid is working (may start on starting handle if fitted no volt drop).If the ballasted resister burns out the car will start but stop as soon as the starter is released and bypass of the resister is disconnected. If the car has an early coil fitted and is marked SW (ignition switch) and CB (contacts points) and it was fitted original to positive earth car that has been converted to negative earth then the CB connection would go to the points. Later coils are normally mark + and - making it easier to connect correctly. 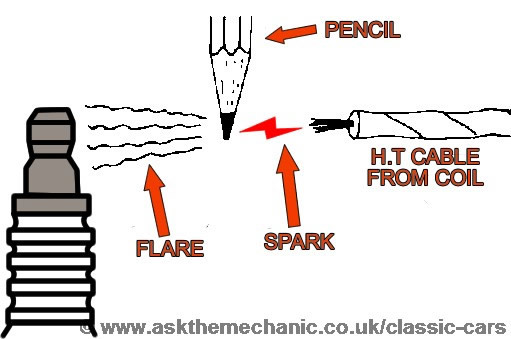 If connected incorrectly the spark will be traveling the wrong way and will not be as strong. It is possible to check this with either an oscilloscope (patterns will be upside down) or with a graphite (real graphite) pencil the flare will be on the plug side (if polarity is correct) or on the cable side (if the polarity is incorrect).